Boil eggs for approx 10-12 minutes in water until hard boiled. Put in cold water to cool and take the shell off the eggs. Place tuna, soup, onion, peas, cord and mushrooms in a casserole dish (a shallow, wide, ovenproof dish). Slice eggs and place on top. 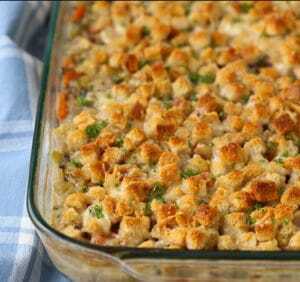 Cut bread into cubes (about 9 squares for each slice), sprinkle on the casserole. Melt margarine in the microwave or in a pan and pour over the top. Serve with salad and bread, rice, kumara or potatoes.